This committee identifies and seeks to develop ways the congregation can function in a more environmentally sustainable manner. This committee also identifies and works with outreach efforts in our community, both local and global. The Green Sanctuary Committee is a Standing Committee of the Board. Although not a project of the Green Sanctuary committee, Eco-Camp (a project of the larger ALUUC congregation) does meet the goals set by the Green Sanctuary committee! EcoCamp is a free week-long day camp for children ages 5-12, with the goal of learning how to be ecologically friendly. Daily themes will explore the earth’s traditional basic elements: Earth, Air, Water, Fire and Spirit. Activities galore including scientific demonstrations, games, songs, art/crafts, stories, nature activities, scavenger hunts, green technology, growing food, recycling and more. Bob Croteau “Solar Bob” from CWLP will be talking about solar power and the solar collectors. Virginia and Jim will take us on “safari” through our patch of Prairie to learn about its ecosystem and how fire is essential to maintaining healthy prairie grasslands. Dave will be giving an overview on houses or dwellings starting with the cave man – as humans evolved to log cabins ,teepees, frame homes to what is possible and available today. Campers will learn about Global Warming through a game of Global Warming Tag. Michelle Knox, president of Springfield-based renewable energy and efficiency company WindSolarUSA, will give a presentation on solar power. Elaine will explore Volcanoes – Destroyers and Creators. Professor Flippy will talk about the importance of not polluting our waterways and campers will practice for Earth Action Day on Saturday. Tabitha will have some amazing bugs for the campers to see and hold. Meg Higgins from Wild Birds Unlimited will teach campers about bird-friendly habitat. An ambassador from the Illinois Audubon Society and Adams Wildlife Sanctuary will be here and campers will learn how to identify birds by sight and sound. Deborah from the Illinois Stewardship Alliance will teach a workshop, All About Wind & Clouds. Cool breezes or mighty gusts, soft and fluffy, or dark and foreboding. Wind and clouds are aspects of nature that fascinate us, and they can help meteorologists predict upcoming weather patterns. Learn about the various types of clouds and how the wind affects them. Van Grissom from Dept of Natural Resources will be bringing his Fish Ambassadors. Saturday is Earth Action Day at the Farmer’s Market in Downtown Springfield. Campers will remind everyone they need to take responsibility for taking care of the Earth! Join us at the downtown Farmer’s Market at 9 AM at 4th and Adams. For 2018-2019, we will plan a green dinner and ways to network with local and statewide Green organizations. Since January 15th of 2015, the 2.7 kilowatt solar array mounted over our heads on the Sanctuary has produced 10.7 Megawatt-Hours (MWh) or 10,700 kilowatt-hours (kWh) of pollution free solar energy. This is 107% of the estimated production so we are doing well. We get an extra bonus for having solar panels by receiving SRECs (Solar Renewable Energy Credits) as well that pay us $90 for every 1 MWh produced in the form of “Carbon Credits”. Over the five-year contract we will receive a total of 13 SRECs for a total of $1,170. peaks up to April of 2015 are the result of the Wi-Fi system not being able to report the data, but it was still being produced and the amount was averaged when the link was finally made. The grey line shows the predicted estimate. One can see that the areas are all similar owing to the fact that it is not losing power output and should still retain 80% of this production after 30 years, yet continue on into the long future. Great investment! solar system installation saved us $3500 over a conventional trenched electrical hook up to the main building’s circuits quoted at $5000. The solar panel delivers 30 volts DC to a “charge controller” that provides a steady charging voltage to the two 12-volt deep cycle batteries wired in series to deliver 24 volts to a pure sine wave inverter that makes 120 volts AC Utility quality power to run the electrical needs of the garage activities. The size of the system needed was kept in check by the LED light bulbs that use 1/10th the power of conventional bulbs. It also sports motion activated LED spot lights on each corner for night time security. Note: When you turn on the lights there may be a 1 to 2 second delay as the inverter gets out of energy saving mode. Low energy lighting – in 2018-2019, we will continue to work with the Facilities Committee to replace ballasts in light fixtures throughout the facility. Window film in 2018-2019, we will continue to reapply peeling energy-conserving window film. We are diligently working towards using less. Our monthly newsletter is distributed electronically, with only a handful of copies distributed via regular mail for members and friends without electronic access. Our weekly and special announcements are distributed electronically, with the eventual goal of not having to print so many. We use regular mugs and cups when possible for our coffee hour, and metal silverware for coffee hour and potlucks. Recycling Containers ALUUC has bins throughout its premises for the purpose of collecting recyclable materials, such as glass, plastic, metal, paper, and cardboard. For 2018-2019, we will work with Facilities Committee to purchase 2 additional recycling containers. Recycled paper products – we are continuing with our goal of using at least 30% recycled paper products. 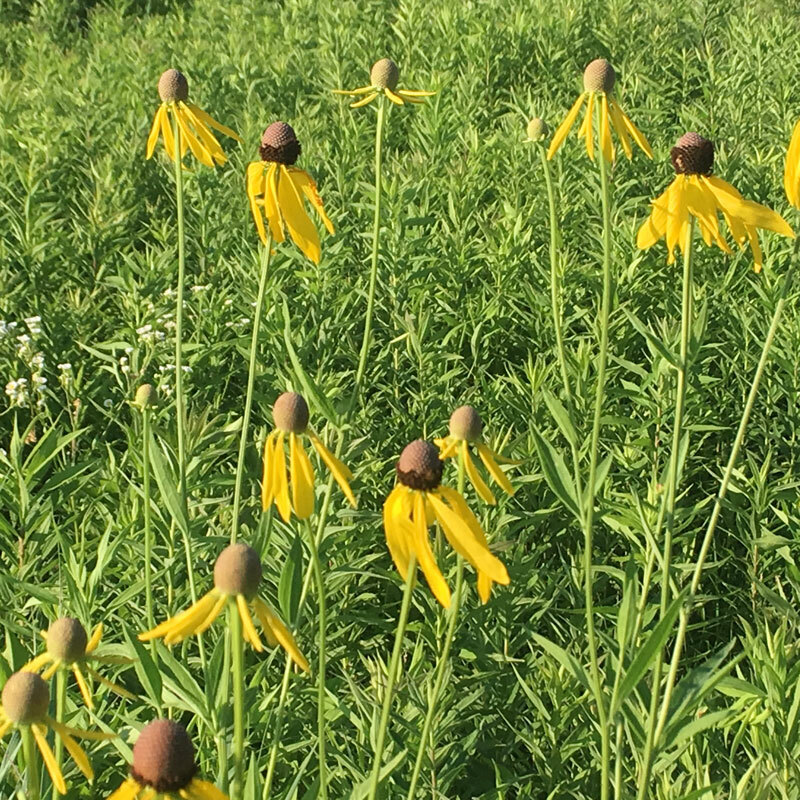 The ALUUC prairie restoration area was established in 2009 with the help of a grant from the Illinois Native Plant Society and the sweat equity of many ALUUC members. The prairie is about 36,000 square feet, nearly an acre. The prairie area provides a reduced carbon footprint, increased wildlife habitat, educational resources, seasonal altar flowers, space for contemplation, seed source, minimal maintenance, and no mowing! 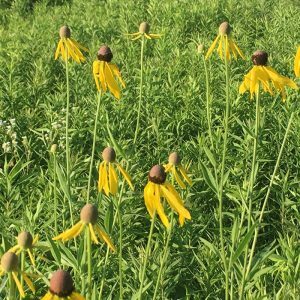 Plants include: nodding wild onion, blazing star, black-eyed Susans, purple coneflowers, penstemons, prairie dock, and compass plant. For 2018-2019, we will incorporate a prairie path, benches and further work to remove invasive species.